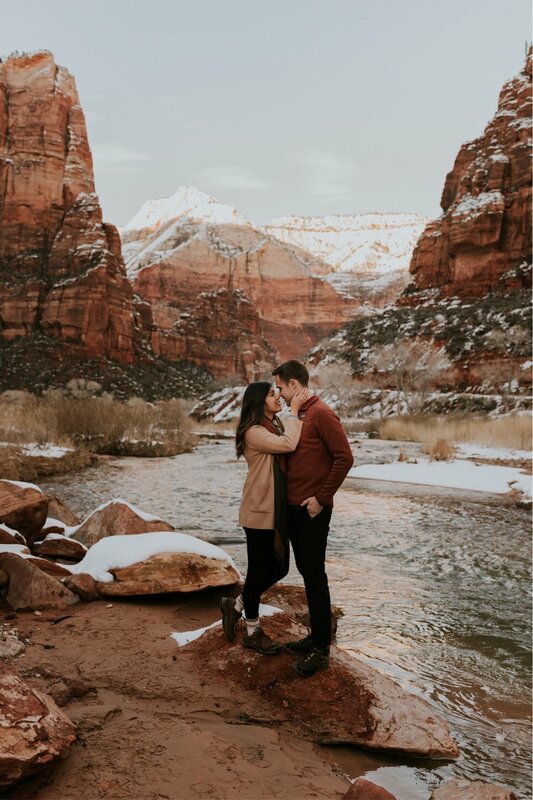 Matt proposed to Eryn at the top of Angel’s Landing in Zion National Park last summer (as Eryn put it in her first email to me, “he definitely made me work for that one! 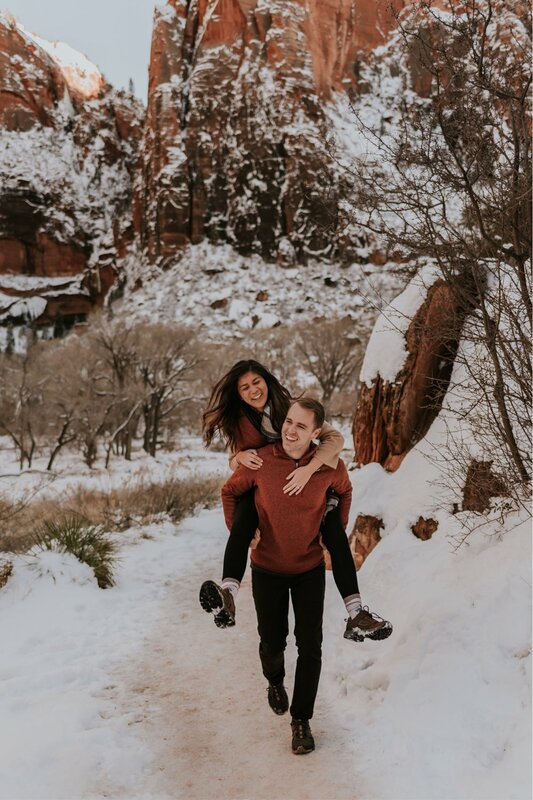 !” hahaha) so doing their engagement session here seemed like the perfectttt idea! They picked me up on a Friday morning and we made the 6+ hour road trip together to Utah, adventured in Zion all day Saturday, and then headed home on Sunday (with a couple stops for Chik-fil-A and alien jerky in between 😉). 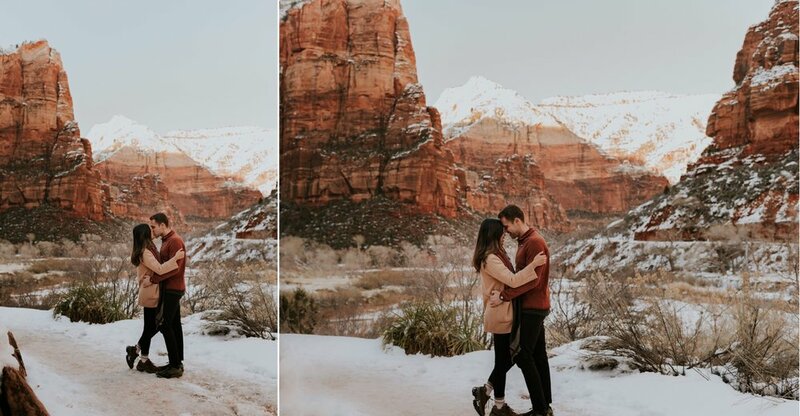 Utah just got a ton of snow the days before our trip and it was the coolest thing ever to see Zion covered in white. 😍 It was a little colder than the last time they were here though! We bundled up in the morning and drove through the park taking in the beautiful views. 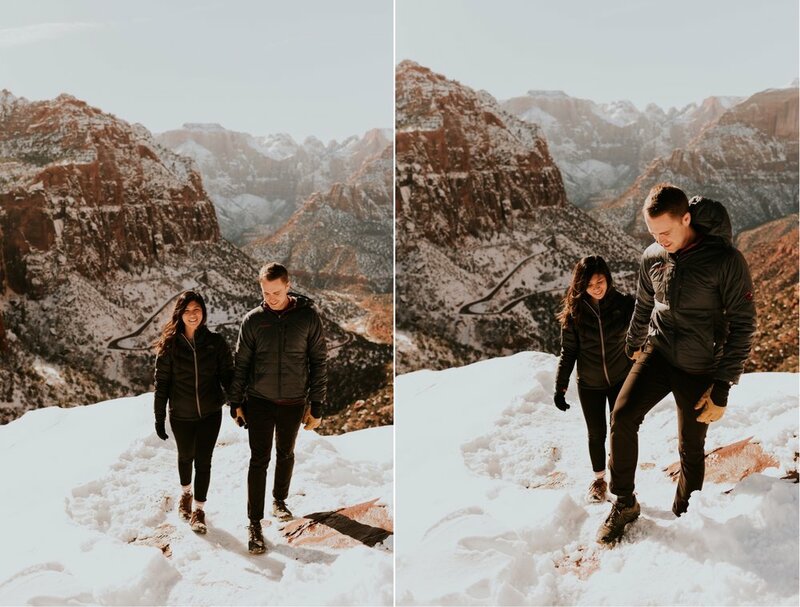 We didn’t do the Angel’s Landing hike this time (that would have been extremely scary with the ice and snow lol), but we did hike to another overlook which is shown in the first few photos below. This is probably my favorite part of the park that I’ve got to see! It was pretty sunny still when we were up there but we couldn’t pass up getting some photos with that view! We made our way back down and ended in a spot with a pretty snow covered canyon backdrop. 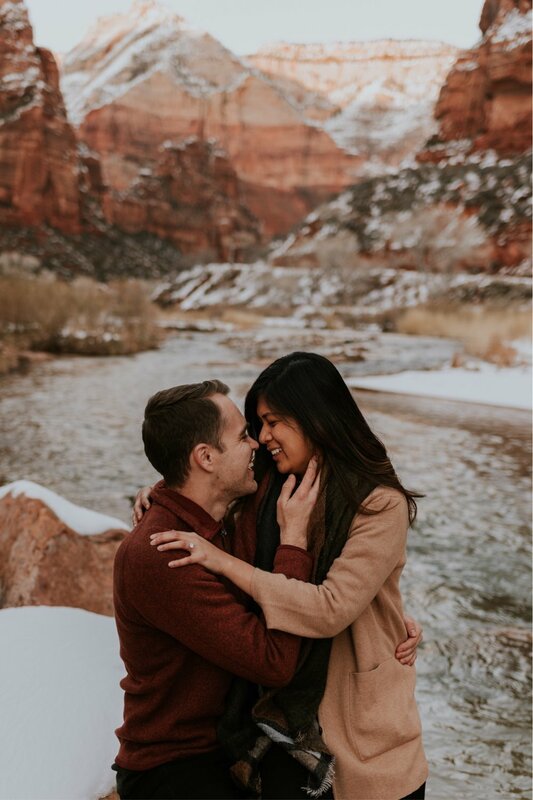 I loved making a little weekend getaway out of their engagement session, because not only did it make the long drive a little more worthwhile, but we got to hang out a lot more without my camera in their faces haha. I learned so much about them and I know their wedding day will go even more smoothly since we’re all comfortable with each other now! So excited for July! For more cute pics of Eryn and Matt, check out this sunrise session we did in Malibu a couple months before our Zion trip!